Total closed length: 37 cm / 14.5 inch; bead size: 6 mm; sterling silver group length: 8 cm / 3.15 inch. 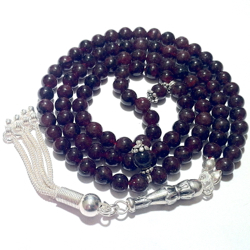 A tasbih made of high quality garnet (also known as granat) in a beautiful dark red color and Turkish sterling silver parts. Ottoman tulip symbols encircle the imame and the end bead.